DR Congo: Can anyone stop Joseph Kabila? While the opposition tries to unite, the presidency seems to be working out various possible scenarios for staying in power. Crowds turn out to see veteran politican and opposition leader Étienne Tshisekedi in 2011. Credit: VoteTshisekedi. For nearly a decade, the Democratic Republic of Congo has been an electoral democracy, a fragile and dysfunctional one, but an electoral democracy nonetheless. However, in the eyes of many Congolese, this status risks being forfeited at the stroke of midnight on 20 December 2016. According to the DRC’s constitution, the president is permitted two consecutive mandates of five years. But with just five months to go until the end of President Joseph Kabila’s second term, there are no signs of an election to appoint his successor. The government has regularly reaffirmed its commitment to elections and attributed the open-ended postponement to technical and financial factors. But given that Kabila doesn’t appear to consider himself bound by the constitution and that he has been notoriously uncommunicative about his intentions, many fear that he intends to delay the election until he can find a way to stay on for a third term. On two separate occasions recently, Kabila has assured the people that elections are coming, but he omitted to say when they would be or whether he will be taking part. Does Kabila want a third term? In recent months, Kabila’s potential route to extending his presidency has become more visible. This May, the constitutional court – responding to a request from 260 pro-Kabila parliamentarians – ruled that that the incumbent is allowed to remain in office until elections are held. This decision horrified the opposition who argue that the Senate President should take over if elections haven’t been held. But for Kabila’s allies, the ruling gives a veneer of legality to a scenario in which Kabila stays on beyond 19 December. At the same time, supporters of the president appear to be preparing the country for the possibility of a referendum to modify the constitution. This plan – which was frequently floated in 2013 and 2014 – seemed to have been dropped in September 2014 after the president of the National Assembly failed to secure parliamentary approval for a referendum. But it appears to now be back on the table. Since June, Henri Mova Sakanyi and Ramazani Shadari – the respective secretary-general and deputy secretary-general of Kabila’s PPRD party – have been telling supporters and reporters that a referendum is the desire of the Congolese people. For instance, the gung-ho Shadari told a reporter this month that “there will be a third term for Kabila that the population is going to impose…either by referendum or another form”. Meanwhile, in an interview on 11 July, Sakanyi cast Kabila as the reluctant leader selflessly awaiting the instruction of his people. “He doesn’t want to change the Constitution and a referendum is not on the agenda”, he said, before adding that a referendum would be “constitutional” and that if the population calls for one “we will bow before their will”. To the surprise of no one, billboards and banners have also begun to pop up throughout the country welcoming a referendum and unending Kabila hegemony. While progress may have been relatively smooth thus far, recent history suggests that this plan will not be plain sailing. After all, in 2014, the president’s allies failed to secure the 60% super-majority in the National Assembly necessary to organise a referendum. In that vote, some of the politicians that made up Kabila’s parliamentary majority must have gone against his wishes. And in September 2015, the president’s dominance in the National Assembly was further weakened when a platform of seven parties – known as the G7 – split from the government. Meanwhile, Kabila’s supporters must also be aware that any attempt to bludgeon a referendum bill through the legislature could trigger the kind of unrest witnessed in January 2015. 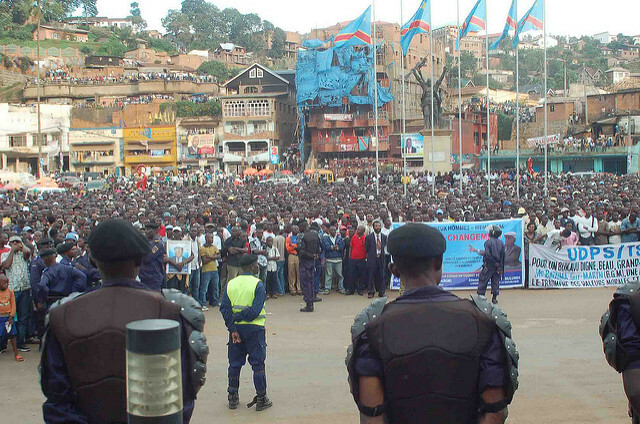 Back then, protesters in towns across the DRC took to the streets against proposed changes to the electoral law that could’ve extended Kabila’s rule. In the repression that followed, dozens were killed. The insistence by the likes of Sakanyi and Shadari that the Congolese population is clamouring for more Kabila is also highly dubious. Kabila is deeply unpopular in much of the country and, although there is no reliable polling, it is thought the majority of the population would prefer to see a new head of state before the year is out. This means that even if the president’s political footsoldiers can engineer a referendum, it is probable they would have to deploy a variety of underhand tactics to win it. If the route to Kabila’s continued rule via a referendum is ruled out, another possibility is that the president could anoint a dauphin to run with his blessing. There are no immediately obvious nominees for this role, but the possibility certainly seems to be under consideration. For instance, Kabila’s chief diplomatic counsellor has said that while the president will remain in power beyond the end of his mandate, he will leave office at the next election. Whether this is Kabila’s preferred strategy or simply a Plan B if he can’t secure a third term is anyone’s guess. The contrary messages currently originating from Kabila’s allies may be explained by the fact the president is yet to make up his mind on the best strategy and is working on several possible scenarios. What are the opposition’s prospects of spoiling the president’s plans? At first sight, the travails of Moïse Katumbi – whose presidential bid has been swiftly and ruthlessly neutered – suggest it will struggle. The former governor of Katanga Province and member of Kabila’s PPRD quit the ruling party in September 2015. He secured the endorsement of two opposition platforms and launched his presidential campaign in this May. But within two weeks, the 51-year-old found himself subject to an arrest warrant on allegations he had recruited foreign mercenaries. And then, on 22 June, while in South Africa for medical treatment, Katumbi was sentenced in absentia to three years in prison for illegally selling a building. Both charges have been denounced as politically motivated. Historically, the Congolese opposition has been fragmented, riven by competing egos and diverging visions. But at least publicly, most leading figures have acknowledged the importance of confronting Kabila with a united front and behind a joint presidential candidate. However, this is easier said than done. When Katumbi launched his campaign, he did so with the backing of the G7 and a smaller coalition known as the Alternance pour la République (AR). But other major opposition parties such the UNC and MLC have so far shown a clear lack of appetite for a Katumbi presidency. Nevertheless, efforts to unite have been central to the opposition’s strategy. And the showpiece of this quest took place on 8-9 June when Étienne Tshisekedi, who finished as the runner-up in the 2011 elections, held a two-day conference on the banks of Lake Genval in Belgium to which the leaders of the DRC’s main opposition parties and coalitions were invited. This gathering yielded the Rassemblement, a new platform established to resist attempts to change to the constitution and ensure Kabila’s departure from power this year. Beyond providing the opposition with a renewed sense of cohesion, the creation of the Rassemblement was significant for restoring the 83-year-old Tshisekedi – who was chosen to serve as the platform’s president – to the heart of the Congolese opposition. Tshisekedi regards himself as the winner of the 2011 election and has effectively been boycotting national politics since the acceptance of his defeat by the Supreme Court and international community. Furthermore, as of September 2014, he has lived in Belgium on account of his health which has further curtailed his ability to communicate with followers. In spite of this hiatus, however, Tshisekedi remains the best known figure in the Congolese opposition – with the possible exception of Katumbi – and has an unparalleled capacity to mobilise support in important parts of the country, most notably Kinshasa. His central position in the Rassemblement undoubtedly gives the new organisation greater authority. However, while the Rassemblement successfully gathered Katumbi’s devotees – the G7 and the AR – under the same roof as Tshisekedi’s UDPS, it appears to have driven a wedge within the third major opposition coalition: La Dynamique de l’Opposition. At the Genval conference, La Dynamique’s smaller parties took part enthusiastically, but the heads of the coalition’s two largest parties – Vital Kamerhe of the UNC and Eve Bazaiba of the MLC – were conspicuous by their absence. It appears Kamerhe and Bazaiba are wary of what they see as the burgeoning relationship between Tshisekedi and Katumbi. The latter did not attend the conference but is thought to have been closely involved and was represented by the G7 and AR as well as his elder brother Raphael Katebe Katoto, who is close to Tshisekedi. Since the conference, more has been said about La Dynamique’s position, but things remain unclear. The MLC’s Bazaiba has said that La Dynamique is not a member of the Rassemblement but will collaborate with it. Senior UNC figures seem unclear about the nature of their involvement, and to compound the confusion, two of the party’s highest ranking officials participated in the conference in a personal capacity in spite of their party’s position. Meanwhile, the smaller parties within La Dynamique – the most significant of which is Martin Fayulu’s ECiDé – are simply behaving like fully signed up members and seem to have migrated to Tshisekedi’s orbit. Both Tshisekedi and Katumbi have declared their intentions to return to the DRC for a ‘Grand Meeting’ of the Rassemblement in Kinshasa and nationwide demonstrations on 31 July. And if both men were to set foot on Congolese soil, it would undoubtedly invigorate Kabila’s opponents. It should be noted, however, that Tshisekedi’s homecoming has been announced without materialising on previous occasions, while Katumbi will be aware that he risks arrest if he returns. In private, members of the opposition say they are waiting for certain key dates before revealing their hand. These include: 19 September, when the electoral body should call the election; 27 November, the latest date on which the vote should happen according to the constitutional timetable; and 19 December, the final day of Kabila’s mandated term. It will become much easier to evaluate the opposition’s strength and unity after witnessing the kind of force it can mobilise as we approach and pass these milestones. At the moment, it seems that the only option to avoid the opposition and government clashing amidst a deepening constitutional crisis is the national dialogue that Kabila abortively launched last November. According to the president, this would be an inclusive forum aimed at ensuring credible elections, and the UN and international community have repeatedly called for it to be held. But to date, all the main opposition parties have rejected it, dismissing it as a trap. Recently, however, the Rassemblement has agreed to discuss the possibility of a dialogue and has met with the forum’s panel of facilitators, which contains members of the African Union, UN, EU and La Francophonie. The UNC also now appears less hostile to the idea of an internationally-mediated conference. But ultimately, the possibility of talks will depend on whether the opposition is prepared to compromise on certain pre-conditions, such as the liberation of political prisoners and strict adherence to the constitution. In other words, will they make a presidential promise to stand down in December the price of their participation? If so, it’s a price Kabila won’t pay and the talks will not happen. If this is the case, President Kabila will remain in power over an increasingly exasperated country. Most Congolese citizens have not seen any improvement to their quality of life during Kabila’s two terms, and his efforts to prolong his unpopular reign could ignite the most frustrated sections of the population. Latent anger combined with the increasing militarisation of the regime makes for a combustible cocktail. And if this impasse continues, with the last vestiges of Kabila’s legitimacy finally withering away on 20 December, it becomes more likely that Kabila’s future – and that of the DRC – will not be settled at the ballot box or in a mediated forum, but on the streets. William Clowes is a journalist based in Kinshasa, Democratic Republic of Congo. Follow him on Twitter at @WTBClowes. Kabila is finally cornered. Unfortunately, there is no peaceful means to an end to Kabila’s presidency. Bloodshed is eminent in the DRC. democrats, liberals and hollywood, keep racism alive and well in America, because without racism, 75% of democrats would lose their jobs. Great insight overall. Would preferably like to read a little about the two different type of dialogue awaited in DRC. What about the children? When are they going to be president? I guess they don’t matter in your world. This is by far the most objective analysis of the situation in the DRC. Great journalism! Dont let him make things complicated, go, go RDC nothing is impossible!!! Kabila must go election or not he must go . I am so proud of the opposition that became together and push Kabila to step down . The Peoples of DRC are more than capable of conducting elections to standard for November 2016. The CENI must now recognize that the Kabila Cadre have no desire for elections, ever. Therefore, the peoples of DRC must in a manner method civic civil polite excluding any form method violent take civic civil electoral matters into their own hands. Empower and engage with electoral administrative responsibility the local Tribal Leadership who in their regions of influence will be accountable ensuring that only people electorally eligible subject to DRC Electoral Code in Process will be able to vote. Instead of having only the digit immersed in ink, my suggestion would be to have the whole hand immersed into a substance with at least a two week time frame of durability ensuring that only one vote is cast by each citizen. The International Community must be prevailed to provide civic civil electoral logistical assistance inclusive in all matters relating to electoral materials. Making use of already established civic civil social electoral norms will prove most expeditious in the advancement of civic civil electoral integrity. Any civic civil electoral delay must be attributed solely to the incumbent Kabila Government who would rather delay and delay and delay by what ever means possible notwithstanding that subject to the DRC Constitution the November 2016 Election date is no surprise. The Normative Convention in Governance suggests that following September 1, 2016, and most definitely December 20/16 the Kabila Government will be entering into a Caretaker status of governance which must be appreciated by all DRC Citizens as the Kabila Government will be limited in executive endeavours subject to the Caretaker Convention or Holding President Kabila to Strict Limitation in conduct of executive action. Wednesday May 11/16 the DRC Constitutional Court decided that DRC President Joseph Kabila, who is constitutionally forbidden in seeking a third term as DRC President, is now by this Constitutional Court decision able to remain in office as DRC President even if no election takes place before his Presidential mandate expires December 2016. This judicial ruling was decided following the request of the ruling governing party motivated in DRC President Kabila’s failure to commit in setting a firm date for the DRC General Election, mandated by the DRC Constitution. This DRC General Election was to have been conducted in November 2016, prior to the December 2016 conclusion of Kabila’s Presidential mandate. Wednesday’s Constitutional Court ruling was a result of a request for clarification over President Joseph Kabila’s political public fate if the DRC General Election is prevented for reasons not sufficient in logistical rational ensuring that these November 2016 Elections do proceed on schedule. The DRC Constitutional Court grounded their legal decision on article 70 of the constitution stating that a President remains in office until an election decides selecting the next President. The opposition political entities argued in favour of article 75 whereby the President of the Senate assumes Office of President immediately following the statutory conclusion of the incumbent President’s Term of Office. Therefore, this individual will hold the Office of DRC President until an election which by active civic civil social citizen participation who will decide via the ballot their civic choice for DRC President. My concern regarding this decision rendered by this DRC Constitutional Court is that this judicial ruling does not take into account what I refer to as “The Caretaker Convention” limiting the executive powers of President Kabila, who post December 2016 will no longer enjoy the privileges of an elected mandate. Post December 2016 will witness Kabila as DRC President who is merely that of a caretaker who must be strictly limited in the conduct of his Presidential duties inclusive of presidential responsibilities. In my country Canada, Legislative Parliamentary Governance convention requires that the Government command the confidence of the House of Commons at all times. While constitutionally a government retains full legal authority to govern during an election, as well as the responsibility to ensure that necessary government activity continues, the Government is expected to exercise judicious probative restraint in all its executive administrative governance endeavours. This is what is meant as the “caretaker convention”. The reasoning is, following dissolution of Parliament, there is no elected parliament to which the Government can be held accountable, and the Government cannot assume that it will command confidence in the next Parliament as this Government may be defeated. Joseph Kabila in my judgment occupies a similar role in that his executive presidential responsibility must considered as that of a “caretaker” severely limiting his capacity to initiate new government business save that of ensuring that the CENI is able to discharge their civic civil electoral administrative responsibilities effectively and efficiently ensuring that the DRC General Election is conducted in a most immediate timely manner without any form of intimidation. The conventional restriction limiting the extent to which the President should exercise his authority applies when the Presidency is post mandate according to the DRC Constitution. The Caretaker Convention also applies to the outgoing government during any post-election transition to a successor government. The Caretaker convention ends when a new government is sworn into Office. This does not mean that government is barred from making decisions or announcements, or otherwise taking action, during the caretaker period. It can and should do so where the matter is routine and necessary for the conduct of government business, or where it is urgent and in the public interest – for example, responding to a natural disaster. In certain cases where a major decision is unavoidable during a campaign [due to an international obligation or an emergency], consultation with the opposition parties may be appropriate, particularly where a major decision could be controversial or difficult for a new government to reverse. agreed to by opposition parties [where consultation is appropriate]. In determining what activity is necessary for continued good government, the Government/President must inevitably exercise judgement, weighing the need for action and potential public reaction, given the absence of a confidence elected mandate and fully aware that a different government/president will be elected. The duties of Ministers must continue to be fulfilled during the caretaker period. Officials and departmental resources continue to be at the disposal of ministers for the purpose of departmental duties. These duties may or may not be set out in legislation. As is always the case between elections, ministers are obliged to ensure that the resources of the department and portfolio – financial, materiel and human resources – are not used for partisan purposes. In the context of an election, they must be especially vigilant with respect to the distinction between official government business supported by departmental and portfolio resources, and partisan political activities, taking care to avoid even the appearance that departmental and portfolio resources are being used for campaign purposes for the exclusive benefit of one political entity. 3. avoid participating in high-profile government-related domestic and international events, including federal/provincial/territorial events, international visits, and the signing of treaties and agreements. Normal Ministerial Cabinet procedures must be followed in fulfilling the minister’s official duties. The minister must not act independently on any initiative that requires Executive approval. Ministerial operations are severely curtailed during the caretaker interregnum, with Cabinet meeting only as necessary to deal with essential items. But when it comes to questions of constitutional propriety we go beyond the particular merits or otherwise of the agreements and how a decision was reached. We are dealing instead with the practice of government itself – the rules and norms for decision-making in our society – and there ought to be no room for argument in discussion. If we know what our constitutional practice is and should be then we should always insist on its observance. Therefore, I intend to address the character of the constitutional conventions which appear to me to apply in this instance, that is to say, what is regarded as appropriate behaviour by a government in the period following the conclusion of a mandate and leading up to the conclusion of the ensuing general election. What is known in some quarters as the “caretaker convention” is easily described although it is nowhere written down. It is a well-established principle of parliamentary government that once parliament has been dissolved and an election campaign is under way the government’s freedom of decision-making is firmly restricted and should be confined to dealing with only routine matters of administration – apart, of course, from any emergency situation which may arise. More specifically, it is said that three areas of decision-making in particular should be avoided in this period – matters involving considerable controversy, matters which are not urgent [that is to say, matters which can wait for a later decision without causing irreparable damage], and matters where a decision would unreasonably bind the freedom of decision-making of a future government. It is occasionally said as well that matters involving the expenditure of very large sums of public money should also be avoided. There are two reasons for this view, both of which would appear to be obvious. The first is that if the President is out of mandate in time the ordinary mechanisms for scrutinizing the government’s behaviour – question time, a debate on the adjournment, motions for supply, and debate generally – are not available. Everyone knows that in a parliamentary system the power of the executive is potentially enormous. It is the existence of these mechanisms of “constructive obstruction” that takes the edge off that power and assures the people that the government is being kept responsible. But if they cannot be used there must be a compensating reduction in the usual extent of the power of the government. The caretaker convention addresses that issue. An election campaign ensures the selection of a new president and therefore the possibility that its leaders will not be able to take responsibility for the consequences of prior decisions conducted by the immediate past President [Kabila]. It follows that only the most routine administrative decisions ought to be made in this period – decisions, in short, which any government might make – again excepting an emergency. To conclude, it is up to the DRC President Kabila to decide what will be done. Conventions, customs, and practices, simply because they are not in any way linked to legality, must always be grounded within an ethos public political in civic civil social character prescriptive positive.